As with all recipes, try to use certified ingredients when possible. Prepare your zucchini noodles using a spiralizer, sharp knife, or vegetable peeler. If time permits, sprinkle the zucchini noodles with salt and place in a colander. This will remove some of the moisture and result in a firmer noodle. Heat half the olive oil over medium high heat in a heavy skillet. Cook the salmon for 3-4 minutes per side. Remove from the pan and set aside. Tent with foil to keep warm. Add the remaining olive oil to the pan along with the garlic. Cook for 1 minute. Add the zucchini noodles and tomatoes. Cook for 3-5 minutes until al dente. Season with salt and pepper. 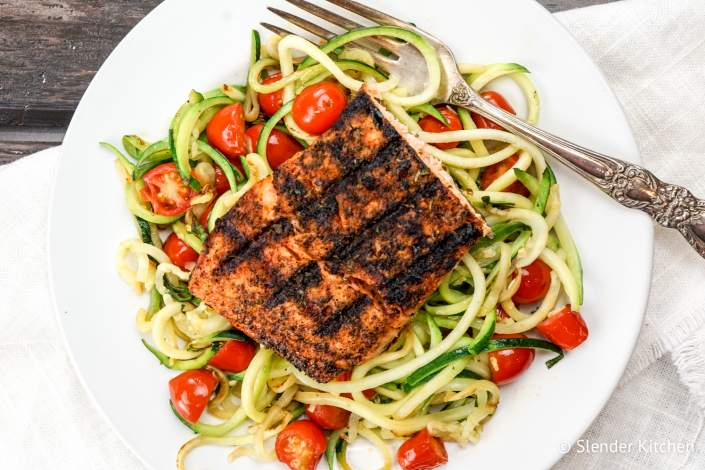 Serve salmon over the zucchini noodles with lemon.